The addition of Kurt Angle to Monday nights and the subtraction of Triple H and Stephanie McMahon has proven to be one of the better moves WWE has made this year. Now that the former WWE champion is “running” the show, fans have been treated to storylines that have helped catapult the red team ahead of SmackDown Live in recent weeks. The nearly four-year run by the Prince and Princess of the McMahon clan became too much to bear at times, where the company was so reliant on the power couple for ratings in the midst of what seemed to be a never-ending program with Daniel Bryan, John Cena and others. Now, Monday Night Raw has a new feel and a solid storyline surrounding the Universal Heavyweight Title. Angle’s inclusion as general manager has made things interesting, and entertaining. 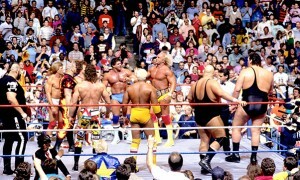 For years, WWE used the McMahon family (including Shane, Vince and Linda) as part of its “normal” programming, where infighting boosted ratings and game Monday Night Raw the soap opera feel patriarch Vince wanted. It was perfect for the Attitude Era and Ruthless Aggression that sold salacious storylines and cutting-edge reality programming. Fans have grown tired of the “over sell” and clamored for something a bit different. Once Daniel Bryan retired and the “Yes!” Movement dissolved, the move to create a story around Seth Rollins as the company’s top heel carried the torch for what Triple H and Stephanie wanted to accomplish. Once Rollins was injured for the first time, the angle lost steam. Not even Roman Reigns could salvage the dying vine. Angle’s inclusion in the recent Fatal Four Way angle for the Universal Heavyweight Title has made the thin existence of Brock Lesnar a viable way to promote SummerSlam. It has also created a rebirth of Vince McMahon’s theory that the “heavyweight” wrestler should be the one carrying his company’s belt. Now that SummerSlam is here and less than a week away, there will be no slow until Brooklyn and a decisive finish to the storyline line that includes Lesnar, Reigns, Joe and Braun Strowman. For a brief moment, the title wasn’t the center of the storyline. The performers have made this confrontational personal, bringing back some of the same traits the McMahons used in spots from a decade ago. With Triple H and McMahon off the small screen, the New Era has a better chance to thrive with new angles (no pun intended) creating more drama and fan interest. WWE will never attain the status it had a decade ago, but changing direction this year has been what’s best for business. The Miz and Maryse, Strowman and Samoa Joe have all benefitted from more air time. The company has continued to push Reigns as their fractured hero. It has also helped the blue brand gain steam because the ever-likable Shane McMahon is the antithesis of his younger sister. WWE isn’t perfect, but it is showing signs of life. The elephant in the room – the McMahon clan – isn’t the overbearing figurehead that detracts from viewership. All of this leads me to believe things are getting better here in WWE. It may not be magic overnight, but the addition by subtraction theory is working so far.